Up the river - Lake Houston Fishing! Did no fishing today but was at the lake to clean the Kraken up. We took the Behemoth up the river to Northshore which is a little ways west of River Grove Park. Took some pics for those interested in going up that far. Photo of the sandbar is looking to where River Grove park boat ramp is only not able to get to the river from it any more due to the flood putting the big pretty sandbar in the way. Picture looking from the front of the boat is going back thru a very narrow cut just west of River Grove. Picture looking behind the boat is after passing thru it again on the way back. There are some very shallow spots so if your boat draws much water, I don't suggest trying to get up that way.....especially with the water level a little low like it is now. Much lower and it will be extremely difficult except by kayak. Hope this info helps folks trying to get up that way. You must have anticipated my question for tonight. How far do people run up East Fork of San Jacinto / Spring Creek / Cypress Creek? Wife and I biked from Hwy 59 up to Jesse Jones Park yesterday on Spring Creek and it was pretty shallow at the park. I do know before the flood that the Pct 4 Parks Department did tours in the area in pontoons and told me they did pretty good fishing white bass in the area during spawn. Ive kayaked down as far as Carter's Park on Spring Creek but never came all the way to 59. The sand bar pic at River Grove crushed my dreams lol.....I was planning to launch there when I get my boat in December. I had heard it was sanded close in the Kingwood paper but I hadn't seen an actual pic. 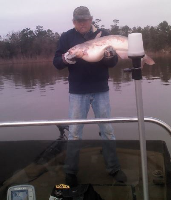 I was just hoping it had gotten real shallow and I could still get across it in my jet or with trolling motor. Looks like the only way to cross now in on foot hahahaha. Raptor, I live in KW also and can tell you a kayak might not even be able to make it thru that cut right now. I have come up from the lake to the river 2x mainly checking out Bellau Woods are where we seem to catch a few almost everytime. Totally unrecognizable now. Have not been to 59 yet. In my boat I have been about .5 mile upstream in my 19ft boat of the bridge that crosses cy creek in the back of foxwood ( far W end of JJones), I could not make it to Spring/Cy split last time due to sand drifts all over the trails ( on my bike, same path you took). Thing is, I am not sure it can be ran from 59 now, I look at it every time and the shallower it gets, the more that cut ( Spring in L, W fork is right, just W of 59) seems like a sandbar, no ripples, flat water. I fished JJones prior to it being a park in the 70's, we lived in 36th home built in Kenswick in 1978, used to ride motorcyles......and catch so many whites you could not count. all with a spinning rod and maybe one extra beetle spin. Spring creek used to fish real good about 1 mile from San Jac, now there is an island in the middle, messed whole spot up. Then further down where pipeline is, same thing shifted, filled holes in, ruined it. We got a lot of crappie in CyCreek 3-4 yrs ago, not much in last 2 due to flooding. Hope to find more this year, may scout it Sat. I can tell in 1 trip if subsequent trips will be successful. Thanks for the info. From what I saw from the bike trail I was thinking the same thing. Did you enter the River from the main lake? If so, what route did you take? You can hug the N shoreline and get around that sandbar no problem. You'll run back thru it on plane I promise once you go thru it once. I just spoke to a good contact up on Cy Creek, checking conditions and he told me Cy Creek is being dredged and all structure removed? Called Mercer and JJones, they dont know anything about it. He is calling me today and I will post back. Surely that would have been made public, unless it is on private property and an individual is doing it, which I suspect. We were going to jon boat it from the stable up to the house on he edge of the creek to check crappie and white holes, maybe not now! Just spoke to him, they have been doing this for 2 months. And they are clearing back along the edges to keep trees from falling in that block flow. Said they cleaned it up and are trying to raise the bank. Cant park underneath the bridge there at horse stables he told me, and they have been clearing E of the Cypresswood bridge, just having started on the W side now. Surprised there was no announcement with all the talk about people wanting this done.